The child brides often suffer sexual abuse and domestic violence in its many forms and are frequently forced to become mothers at an age that puts them at high risk of maternal injury and death. 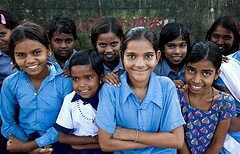 Because the harmful practice receives relatively little attention as it continues year after year, The Elders, independent global leaders brought together by Nelson Mandela in 2007, launched the Global Partnership to End Child Marriage with a campaign called Girls Not Brides. Creating awareness of these social and economic interactions is one of the goals of the Girls Not Brides campaign, which harnesses the collective efforts and wisdom of 80 organizations from around the world to tackle child marriage at grassroots, national and global levels. Says Tutu, “Simply put, we do not have to accept that child marriage happens because it is just ‘how things have always been.’ What we want is for world leaders to make sure this change happens on a global scale.” Tutu is appearing this week at the World Economic Forum (WEF) in Davos to promote programs with proven results. “It’s the kind of work that’s being done already by people at a local level,” he says. “Now just imagine the scale of change possible if our leaders followed their brave lead.” On a panel with Michelle Bachelet, executive director of UN Women, and Sheryl Sandberg, CEO of Facebook, he will also address the issue Friday, January 27, during a WEF plenary session on “Women as the Way Forward”—in a panel moderated by New York Times columnist Nicholas Kristof. Next month four members of The Elders, including Tutu and Robinson, will visit India to learn about the causes of child marriage there, and to encourage local efforts to end the practice. To learn more or get involved, you can visit the Girls Not Brides web site and watch a Girls Not Brides short educational video here.